Mon., Oct. 29, 2018, 7:33 p.m.
PULLMAN – The top passer in college football is beginning to receive national recognition for his role in Washington State’s 7-1 start to the 2018 season. On Monday, quarterback Gardner Minshew was named one of 20 semifinalists for the Maxwell Award, which annually recognizes the best college football player in the country. Voters will select three semifinalists for the 82nd Maxwell Award, which will be announced on Nov. 19, and the winner will be unveiled at the ESPN Home Depot College Football Awards Show on Dec. 6. Ten quarterbacks joined Minshew as Maxwell Award semifinalists: Alabama’s Tua Tagovailoa, Fresno State’s Marcus McMaryion, Houston’s D’Eriq King, Notre Dame’s Ian Book, Ohio State’s Dwayne Haskins, Oklahoma’s Kyler Murray, Oregon’s Justin Herbert, Penn State’s Trace McSorley, UCF’s McKenzie Milton and West Virginia’s Will Grier. Pac-12 players joining Minshew included Oregon’s Herbert, Colorado wide receiver Laviska Shenault and Utah running back Zack Moss. 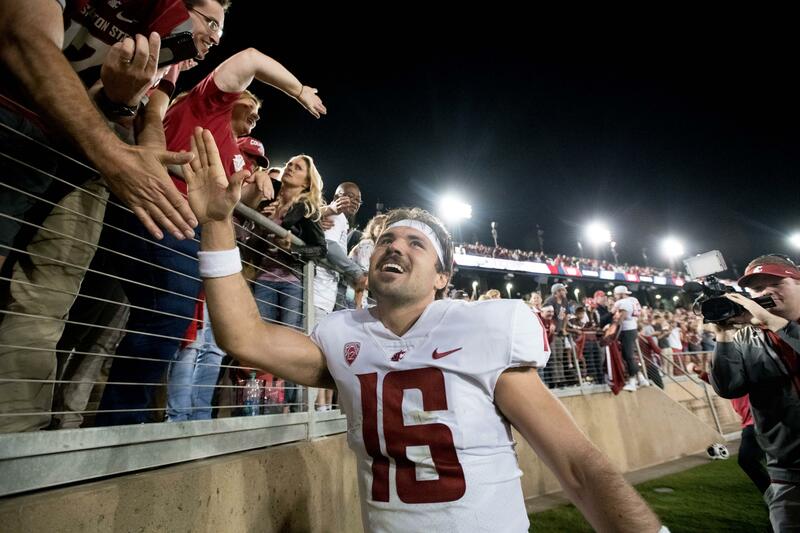 Minshew completed 40-of-50 passes for 438 yards and three touchdowns in WSU’s 41-38 road win over Stanford on Saturday, improving on his FBS-leading yardage totals. The East Carolina graduate transfer who won WSU’s starting job in August is No. 1 in the country with his 3,183 passing yards, 397.9 yards per game and 294 completions. Minshew ranks fifth nationally with 26 touchdown passes and he’s thrown just six interceptions this season, on 414 attempts, which equates to one pick per every 69 attempt. The fifth-year senior also added to his collection of weekly awards, being named Athlon’s Offensive Player of the Week for the second straight week, while also being added to the Davey O’Brien Award’s “Great 8” quarterbacks list for the ninth week of the season. Minshew was also named the CBSSports.com College Football Player of the Week for his effort against Stanford. Published: Oct. 29, 2018, 7:33 p.m.